While there is significant “covenant” language in the story of Noah (God covenants with the earth and promises its continued existence, marked with the sign of the rainbow), in the Abraham story, covenant is personal and more specific. God chooses, calls, guides, protects this one man and creates covenant with him and his descendants. Covenant is always God’s initiative and God’s sustaining grace. From Abraham, the story will persistently narrow. It is his son, Isaac who continues this particular covenant relationship with God, not Ishmael. It is Jacob who continues The Story, not Esau. Jacob’s twelve sons become the tribal people of Israel who eventually become the political nation of Israel. There are countless stories of other people and nations who lived during the time of the stories of the Patriarchs and Israel, but they either are not mentioned at all or are mentioned in a kind of footnote. The Hebrew Scriptures are the story of one particular people. It is Israel’s witness of their experience with the one true God; the good, the bad and the ugly of their human experience. Their mistakes, misunderstandings, foolishness and violence are documented with startling honesty. 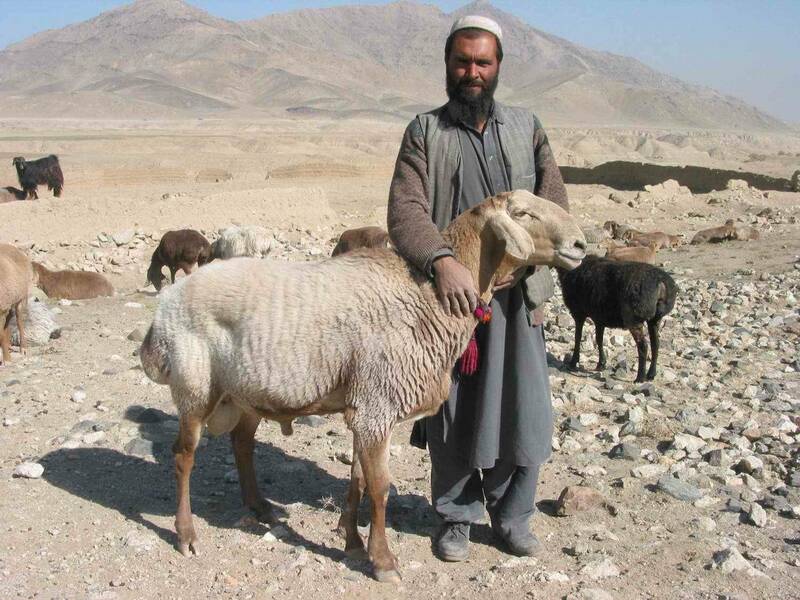 As you read Psalms 23 and 25, consider the nomadic life of Abraham, a shepherd of his time, dependent upon the land and the seasons. Watch for the affirmation of the covenant recognized both in relationship with God and relationship to the land. As you read John 13-17, you will see the beginning of John’s Passion Story. The washing of the disciples’ feet, the final discourse/teaching, the Lord’s prayer for his followers – watch how John’s Jesus is confident and unshaken by the coming event of the cross. This Jesus is always in charge, always in control. “Abraham is our father” … these opponents insist. “If Abraham were truly your father, you would do what Abraham did” … Jesus responds. “We have one father, God himself” … they counter. “You are from your father, the devil” … Jesus accuses. “You are a half-breed, possessed by a demon” … the dialogue heats up. “Your ancestor Abraham saw my day and rejoiced” … Jesus tantalizes. “YOU have seen Abraham?!? !” … they mock. As John’s Jesus has spoken so often in this gospel, here again he proclaims: “I AM.” It’s a theologically brazen claim; a Christology that conflates the being of Jesus with the being of God. Consider how difficult it would be for faithful monotheists to hear this. In the journey of faith, remember how crucial it is to “begin with faith.” John demonstrates what it can look like when religion is not actually grounded in faith; when the forms and doctrines become more important than a foundational trust in God. God will not live in our boxes nor jump through our hoops. “Trust” means we trust anyway even when we do not understand. As you read Romans 4-8, see how the apostle Paul hearkens back to the Abraham story to make his crucial arguments for the inclusion of Gentiles within the new Christian community. Abraham is the father of ALL the faithful, he insists, not just those who are circumcised (a crucial symbolic act for all faithful Jewish males.) “Circumcision of the heart” is the sign of unity within the Christian community. A person is a Jew who is one inwardly, and real circumcision is a matter of the heart—it is spiritual and not literal. Abraham’s faith was “reckoned to him as righteousness” before he participated in the sign of circumcision. This is huge for Paul. It’s not the obeying of the Law that produces righteousness but rather the living in faithfulness, living with trust. Paul uses Abraham as an example: the way Abraham believed in the promise and trusted in God’s word that he would have a son even when his body was as good as “dead.” Acceptable relationship with God doesn’t come about by our human efforts; relationship (covenant, promise) is God’s divine grace to us. Just as Abraham experienced grace – with all his mistakes and stumbles, with his “dead” body – so we too experience God’s gift in our weaknesses, in our sinfulness, in our estrangement. There is therefore now no condemnation for those who are in Christ Jesus. For the law of the Spirit of life in Christ Jesus has set you free from the law of sin and of death (8:1-2). If Christ is in you, though the body is dead because of sin, the Spirit is life because of righteousness (8:10). Paul’s letter to the Romans is considered a masterpiece of theological reflection by a master theologian. Romans played a crucial role in the thinking of Martin Luther and was a catalyst for the Protestant Reformation. Photo (Chris D): This icon representing the embracing of Jewish & Gentile Christians can be found in the St Peter and St Paul Orthodox Church, Antakya, Turkey (formerly Syrian Antioch). 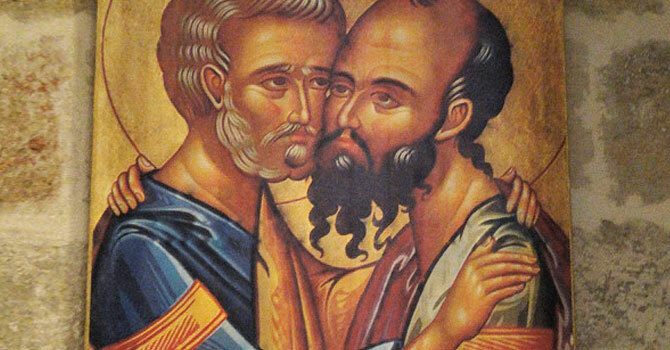 Peter was the apostle to the Jews and Paul the apostle to the gentiles. Previous Previous post: Week 4: Abraham. Where is All This Going?